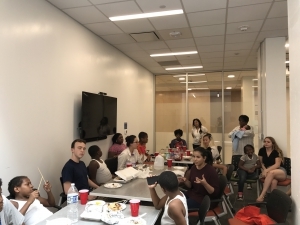 Last Sunday was the busiest day yet for Learning Life’s Citizen Diplomacy Initiative (CDI): two live international dialogues, and one international potluck. All three events exemplified how Learning Life is building peace through dialogue and collaboration across divides of race, class and nation. 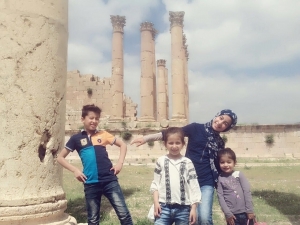 The day began with a live dialogue between Learning Life staff and a Jordanian family in the city of Jerash, Jordan, home to extensive Roman era ruins. 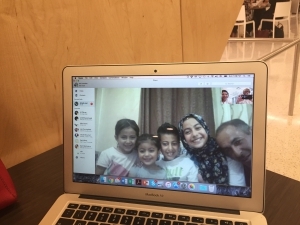 Learning Life’s Director, Paul Lachelier, and former U.S. foreign service employee and volunteer Arabic interpreter, Jamila Attaoui, discussed a photography guide with the Mustafa family in Jordan. Next, we organized an international potluck bringing together people who normally don’t meet, let alone eat and talk together: African American families east of Washington DC’s Anacostia River, George Washington University students west of the River, and experienced U.S. foreign service officers. 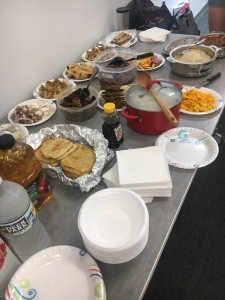 Those who came to the potluck with a dish explained its contents and cultural origins, pointing to the country of origin on a world map when the dishes were foreign. The potluck then moved to this discussion question: “Why is there so much social division (racial, religious, national, etc. ), and what can we do to help overcome these divisions?” The participants focused mostly on how to overcome those divisions, and their answers underscored the need for dialogue, friendship, even marriage, across social divides. It helped, coincidentally, that one of the parents participating in the potluck had just given birth to bi-racial twins, who came along for the fun. 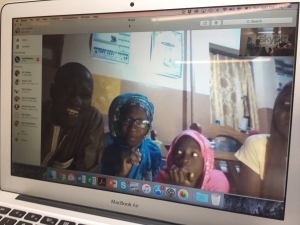 The day finished with a live internet dialogue between two American families in Washington D.C. and a Senegalese family in Dakar, the capital of Senegal. The families discussed photos the Senegalese family recently shared as part of their first international collaboration, the photovoice project. A growing number of photos from our CDI participants in the USA, Senegal and Jordan are gathering at our new Facebook page, which allows our international families to see each other and comment on their own and others’ project contributions. We look forward to seeing our CDI Facebook page come alive as more and more families join from across the world. Building world peace takes sustained, conscious effort. That’s why we at Learning Life are developing a novel model for building peace, based on (a) live internet dialogues and (b) project collaborations between (c) lower-income families rooted in (d) particular neighborhoods across the world. Stay tuned for more as we develop and test this model through international dialogues, projects and activities like the ones above.